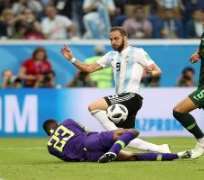 The Super Eagles have crashed out of the Russia 2018 FIFA World Cup after losing 2-1 to Argentina in their final Group D game here in Saint Petersburg on Tuesday. Lionel Messi opened the scoring in the first half before Victor Moses equalised from the penalty spot. The Barcelona star's goal was the 100th of this summer's World Cup. But late into the game Marcos Rojo scored the winner to send Argentina into the last 16. The win for Argentina was their fifth straight win against the Super Eagles at the World Cup. The last time the Super Eagles crashed out in the group stage was at the 2010 World Cup in South Africa. Argentina now join Croatia who beat Iceland 2-1 in the round of 16. Croatia will now face Denmark who finished second in Group C while Argentina will meet France. Ahmed Musa had the Super Eagles' first attempt on goal on eight minutes but his shot from outside went just over the bar. Argentina eventually opened the scoring through Messi on 14 minutes who controlled a long pass from Ever Banega before shooting past Francis Uzoho. In the 26th minute Uzoho made a big save as he quickly came off his line to prevent Gonzalo Higuian from doubling Argentina lead following a defence splitting pass from Messi. Messi almost made it 2-0 from a free-kick close to the box on 34 minutes but his well struck effort got the slightest finger tip touch from Uzoho and came off the post. Before the start of the second half, the Super Eagles made the game's first change with Odion Ighalo replacing the ineffective Iheanacho. The Super Eagles were back on level terms on 51 minutes thanks to Moses on from the penalty spot after Javier Mascherano fouled Balogun inside the box. In the 71st minute Wilfred Ndidi hit a superb strike outside which went just over the bar. Ighalo had a chance to put Nigeria ahead in the 76th minute but he hit the ball wide. There were calls for a penalty by the Super Eagles players after Marcos Rojo was adjudged to have handled the ball inside the box but after consulting with VAR the referee did not give it. Oghenekaro Etebo almost scored from a free-kick on 86 minutes but his effort hit the side netting. Argentina went 2-1 up on 86 minutes thanks to Rojo who slammed in a cross from the right (Complete Sports).